Create small willow structures such as wreaths and plant supports using local willow. Learn how to grow, prepare and store willow and how to make living willow structures. Plus take home a few cuttings to plant in your garden. Discover the life and behaviour of the European wolf and how it is reintroducing itself across nothern Europe. The course will include wolf adaptation, folklore, family relationships and communication and a visit to see Wildwood's European wolves in their stunning winter coats. Learn how to identify our larger mammals from their tracks, signs and sightings. Includes examination of skins, skulls and antlers and a tour of Wildwood to see some of the animals in the flesh. *Please note that this course does not over mice, voles or shrews which are covered in the Small Mammal Survey Skills course. It's the year of the snake! Celebrate the new Lunar New Year with our fun craft event! Make snake crafts, animal puppets and discover your Chinese zodiac sign before dancing the traditional Chinese dragon! 1.30pm - 3pm. £3 per person, one adult free per group. Must book with the Wildwood office on 01227 712 111. Discover the amazing Ice Age world of massive mammoths and savage sabretooths and make your own mammoth and sabretooth crafts to take home. 2pm - 3.30pm. £3 per person, one adult free per group. Must book with the Wildwood office on 01227 712 111. Tuesday 19th Feb & Wednesday 20th Feb - Dinosaurs! 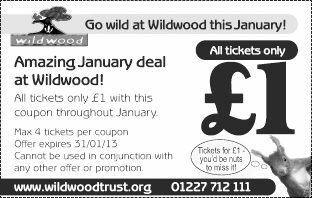 Cheer yourself up this January with a visit to Wildwood for only £1! Simply print off the voucher and bring it to Wildwood for up to four tickets at only £1 each.